Here in the Orient the gentle buds for white tea have been picked and of late, green tea has come of season. We of the orient are well aware, upon scoping out the looming clouds that rainy season is soon to be upon us bringing the occasional typhoon. At my window on the 17th floor overlooking the East Sea I pondered while I pressed my own fighting trousers. Khaki 'capri pants' as they are called in the Occident. In the interim I was to be found in my Yukata watching the latest sumo matches and getting much in the fighting spirit of the season. Thus it was with much relish my eyes have, of this night, fallen upon a 2011 article entitled The Problem With Asian Steampunk. The author, a Mr.Jeff Nevin was lamenting the lack of variety in those 'portraying' Asian characters stating that there were only "Samurai, Ninja and geisha" to be found. Perhaps he has been only looking in the west. I ask you, members of the East Orient Steampunk Society at large : has he come to our Orient? Could he be right? Mr Nevin is quick to remind us and that, "Pirates, submarine captains, hard-boiled reporters, female private detectives... these are all part of east Asian history and popular culture in the steampunk era". He ends exhorting us to a greater creativity with, "Steampunk writers and cosplayers, expand your horizons!" In this blog I intent to take Mr.Nevin to task on the issue proving that there is variety to be found and due much credit in steampunk society of the East Orient. Indeed, even a cursory search of the Internet has provided me with a few artists and even an English language steampunk author living in Korea writing Asian oriented steampunk novels. Thus I am to don my Canadian Tilley hat and yellow trench coat and strike out in upcoming months to find and report on this animal that is East Oriental Steampunk Society. P.S. alas, _another_ night of fireworks in the neighbourhood. My Chinese Opera "Teahouse Owner" jacket, 'out and about' tea pants and Dobby the dog. 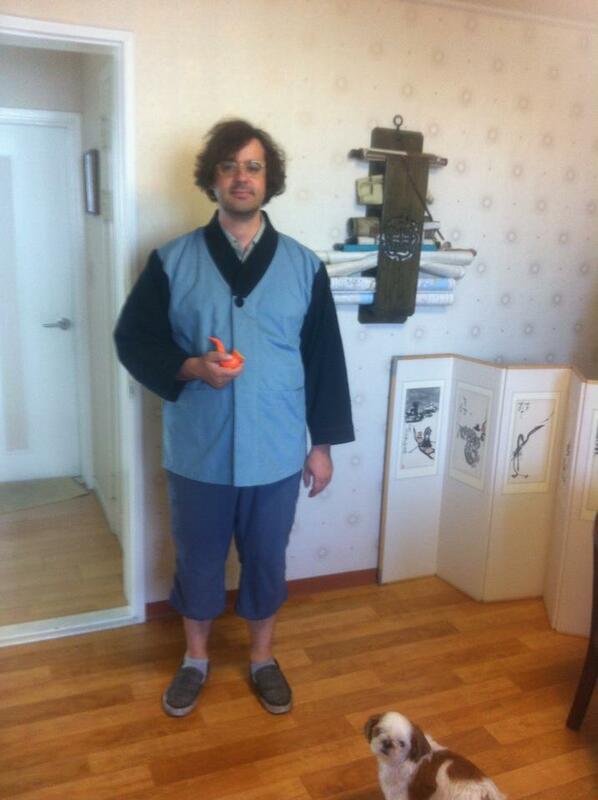 Matthew William Thivierge has abandoned his PhD studies in Shakespeare and is now currently almost half-way through becoming a tea-master (Japanese, Korean & Chinese tea ceremony). He is a part time Ninjologist with some Jagaek studies (Korean 'ninja') and on occasion views the carrying on of pirates from his balcony mounted telescope. Based in Busan South Korea, he often finds himself in China or Japan and oftentimes in the heart of Seoul. When in Seoul ... Dinner with Dance Performance !